If you were to remove all the organelles from a cell, would the plasma membrane and the cytoplasm be the only components left? No. Within the cytoplasm, there would still be ions and organic molecules, plus a network of protein fibers that help maintain the shape of the cell, secure some organelles in specific positions, allow cytoplasm and vesicles to move within the cell, and enable cells within multicellular organisms to move. Collectively, this network of protein fibers is known as the cytoskeleton. There are three types of fibers within the cytoskeleton: microfilaments, intermediate filaments, and microtubules ([link]). Here, we will examine each. Microfilaments thicken the cortex around the inner edge of a cell; like rubber bands, they resist tension. Microtubules are found in the interior of the cell where they maintain cell shape by resisting compressive forces. Intermediate filaments are found throughout the cell and hold organelles in place. Of the three types of protein fibers in the cytoskeleton, microfilaments are the narrowest. They function in cellular movement, have a diameter of about 7 nm, and are made of two intertwined strands of a globular protein called actin ([link]). For this reason, microfilaments are also known as actin filaments. Microfilaments are made of two intertwined strands of actin. 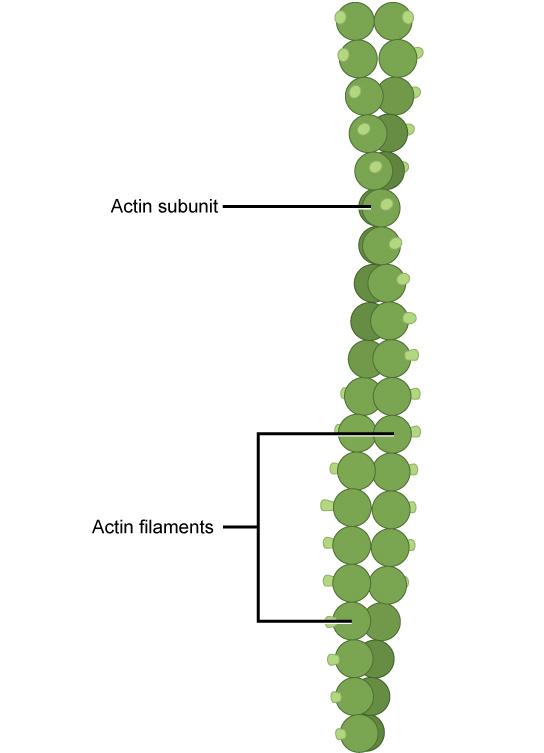 Actin is powered by ATP to assemble its filamentous form, which serves as a track for the movement of a motor protein called myosin. This enables actin to engage in cellular events requiring motion, such as cell division in animal cells and cytoplasmic streaming, which is the circular movement of the cell cytoplasm in plant cells. Actin and myosin are plentiful in muscle cells. When your actin and myosin filaments slide past each other, your muscles contract. Microfilaments also provide some rigidity and shape to the cell. They can depolymerize (disassemble) and reform quickly, thus enabling a cell to change its shape and move. White blood cells (your body’s infection-fighting cells) make good use of this ability. They can move to the site of an infection and phagocytize the pathogen. To see an example of a white blood cell in action, watch a short time-lapse video of the cell capturing two bacteria. It engulfs one and then moves on to the other. Intermediate filaments are made of several strands of fibrous proteins that are wound together ([link]). These elements of the cytoskeleton get their name from the fact that their diameter, 8 to 10 nm, is between those of microfilaments and microtubules. Intermediate filaments consist of several intertwined strands of fibrous proteins. Intermediate filaments have no role in cell movement. Their function is purely structural. 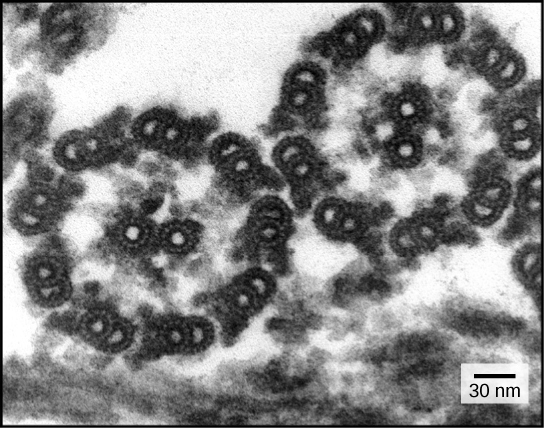 They bear tension, thus maintaining the shape of the cell, and anchor the nucleus and other organelles in place. [link] shows how intermediate filaments create a supportive scaffolding inside the cell. The intermediate filaments are the most diverse group of cytoskeletal elements. Several types of fibrous proteins are found in the intermediate filaments. You are probably most familiar with keratin, the fibrous protein that strengthens your hair, nails, and the epidermis of the skin. As their name implies, microtubules are small hollow tubes. 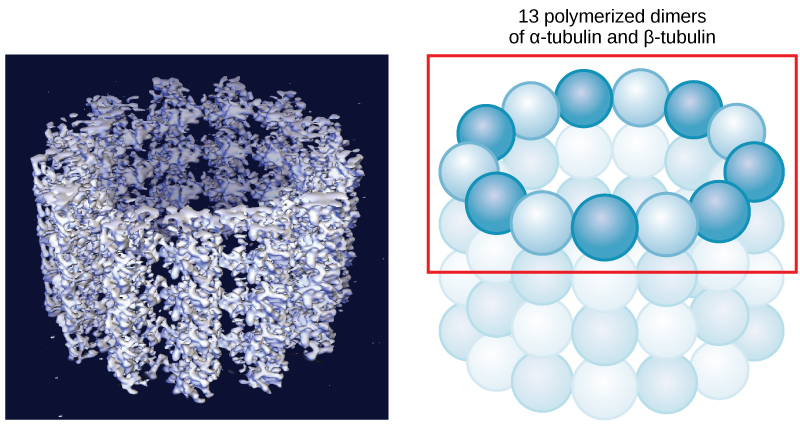 The walls of the microtubule are made of polymerized dimers of α-tubulin and β-tubulin, two globular proteins ([link]). With a diameter of about 25 nm, microtubules are the widest components of the cytoskeleton. They help the cell resist compression, provide a track along which vesicles move through the cell, and pull replicated chromosomes to opposite ends of a dividing cell. Like microfilaments, microtubules can dissolve and reform quickly. Microtubules are hollow. Their walls consist of 13 polymerized dimers of α-tubulin and β-tubulin (right image). The left image shows the molecular structure of the tube. Microtubules are also the structural elements of flagella, cilia, and centrioles (the latter are the two perpendicular bodies of the centrosome). In fact, in animal cells, the centrosome is the microtubule-organizing center. In eukaryotic cells, flagella and cilia are quite different structurally from their counterparts in prokaryotes, as discussed below. Despite their differences in length and number, flagella and cilia share a common structural arrangement of microtubules called a “9 + 2 array.” This is an appropriate name because a single flagellum or cilium is made of a ring of nine microtubule doublets, surrounding a single microtubule doublet in the center ([link]). You have now completed a broad survey of the components of prokaryotic and eukaryotic cells. For a summary of cellular components in prokaryotic and eukaryotic cells, see [link]. Flagella Cellular locomotion Some Some No, except for some plant sperm cells. The cytoskeleton has three different types of protein elements. 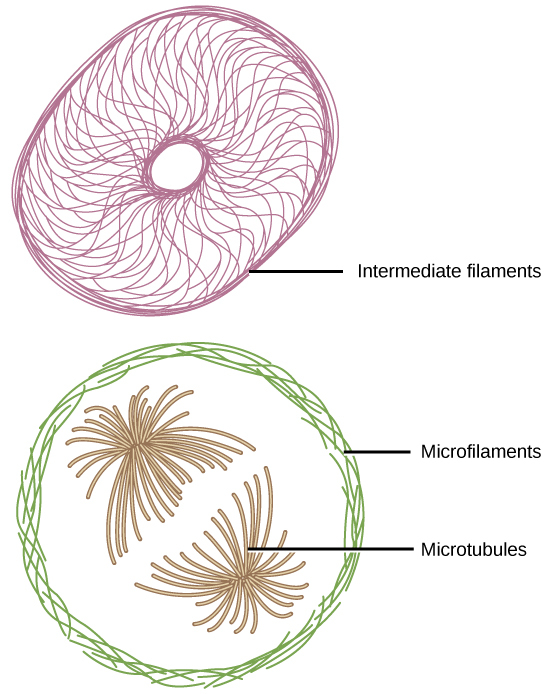 From narrowest to widest, they are the microfilaments (actin filaments), intermediate filaments, and microtubules. Microfilaments are often associated with myosin. They provide rigidity and shape to the cell and facilitate cellular movements. Intermediate filaments bear tension and anchor the nucleus and other organelles in place. Microtubules help the cell resist compression, serve as tracks for motor proteins that move vesicles through the cell, and pull replicated chromosomes to opposite ends of a dividing cell. They are also the structural element of centrioles, flagella, and cilia. 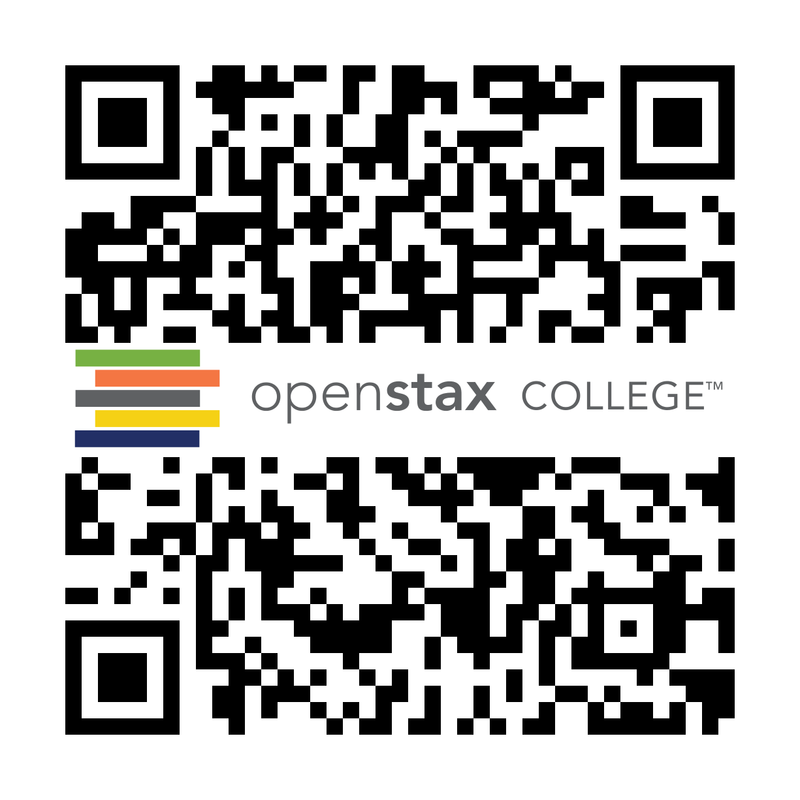 The Cytoskeleton by OpenStaxCollege is licensed under a Creative Commons Attribution 4.0 International License, except where otherwise noted.